One day in my Cellular Biology I class something funny happened. sewing machine by Japanese scientists. The goal of the device is to bond two DNA strands without breaking them. "Their micro-sized DNA sewing machine of Z-shaped microhooks controlled with an optical tweezer. The device can pick up a single DNA strand and manipulate it. 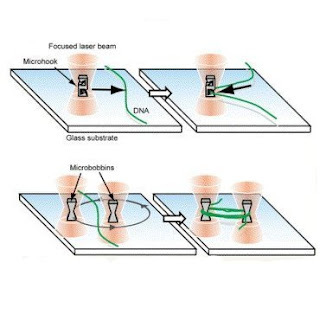 In order to keep the long DNA chain from coiling around itself, the machine then winds up the thread around microbobbins also controlled by focused laser beams, by rotating one around the other so that the wound up DNA chain can then be moved to another location along with the microbobbins." The DNA sewing machine greatly simplifies the diagnosis of genetic disorders, such as Down's syndrome. Bonding an individual DNA strand to another one similar to it is critical since similar genes become fluorescent in the process thus are easier to spot. The scientists can spot the problematic genes and the begin the complex process of fixing it. I can barely fathom the concept of winding DNA around microbobbins as winding thread around macrobobbins [Insert raucous laughter here] is hard enough! Who would have guessed that my love of sewing would coincide with my love of biology?